I recently had the pleasure of viewing the latest exhibition by Meredith Howse at the Lockyer Valley Regional Art Gallery. Entitled Sublime Landscapes this large exhibition of primarily oil paintings on canvas was immediately impressive in its sheer diversity of response to the landscape. From the more representational to the abstract Meredith's paintings explore her deeply held feelings for familiar places as well as the momentary impact of places visited. In Awash (Oil on Canvas) Meredith revisits Byron Bay a familiar landscape of her teenage years. Awash is a strong painterly response to wave action on a rocky shoreline. Topographical details are subordinate to the power of movement which is the real subject of the painting. Rock formations and the sea are equally subject to a condition of flux and the energetic and variable delivery of brush mark is integral to compositional structure and meaning. The work recalls the inheritance of European Impressionism and in particular Monet's paintings of coastal Brittany. However, the contrasting values and colour palette are less about Impressionist prismatic light and shadow and more concerned with a dramatic physicality. Through such means we also sense the artist's visceral projection into the landscape. Meredith Howse’s Awash was selected for the Finalist Milburn Art Award Exhibition 2017. The Pass Byron Bay belongs in series to Awash in its location, drama, painterly exuberance and variable inventiveness of brushstroke. A strong physicality and rhythmical energy is characteristic of the artist's work and equally in conversation Meredith's personal and professional history reveals a strong woman who by her own admission was never afraid to roll up her sleeves and tackle a project. Meredith's chosen vocation of theatre nurse was never an easy one requiring hard work and a commitment to helping those who were suffering and in need. These days her nursing work is strictly part time as Meredith invests her considerable passion and energy in her art. As Cezanne once suggested painting is an expression of the artist's "temperament" and by that he meant a deeply held individual viewpoint intellectual, physical and emotional and not a surface trait of personality. Emile Zola (1866) also said that "A work of art is a corner of creation seen through a temperament". Certainly, the serious landscape painter requires the kind of temperament that allows for a deeply felt and studied response to the beauty of nature. Ideas of beauty both in nature and in art such as the 'sublime' and the 'picturesque' have been extensively examined by art theorists, philosophers and artists since the early 18th century. Supporting the theme of the exhibition Sublime Landscapes Meredith's paintings focus upon time honoured subjects explored by great artists of the Sublime such as Turner and Friedrich. Meredith’s Sunset Byron a brooding image of stark contrasts is such a subject well composed within a square format 90x90cm. The square proves to be a favoured format within this exhibition and is worthy of comment. The squarish rectangle more often than the square has been an important pictorial dimension for many painters such as Monet, Klimt, Lloyd Rees, Arthur Boyd, Fred Williams and Philip Wolfhagen. Perhaps this is because the square or squarish rectangle is very suited to representing a fragment of nature which nonetheless implies a broader connection to landscape beyond the pictorial boundary. Working within this geometric constraint form and space seem to spill over the edge to a wider world. Within contemporary promotional considerations placing one's images on Instagram also imposes this format limitation which may also explain its growing popularity. The term Sublime took on a profounder meaning when Shaftesbury (1711) and subsequently philosophers such as Burke and Kant and writers notably Ruskin and Romantic era poets and painters searched for metaphysical meaning and a new aesthetic in response to certain natural phenomena. The experience which comes to us in contemplating those aspects of nature which appear to be too large or powerful to be comprehended by the senses and the attempt to embrace such infinite possibility became known as the experience of sublimity. Turner, Friedrich, Wordsworth, Ruskin and other proponents of the Romantic movement contemplated the sublime aspects of nature as a source of spiritual sustenance and aesthetic realization. The continual flux of the ocean or waterfall, the power of a storm or mystery of vast distances became their subjects not as artificial contrivance but as a deeply felt response to the natural world. Post Modernism and contemporary art developments have often appropriated the stylistic veneer of the 'Romantic art of the Sublime' however a deep appreciation of the Sublime in art and nature remains as relevant as it was in Ruskin's time. Meredith's paintings in title (e.g. Sublime Sea) and subject suggest her contemplation of the 'sublime'. Images of storms, distant vistas and the flux of the sea predominate. In discussing her work Meredith's preference in her words when " I hit the nail on the head" invariably is a choice made on the basis of strong emotional attachment to place. In Tranquil Lake the artist responds to her mother's place in the expression of an atmosphere. Misty veils of light and coloured greys descend upon the calm and glassy surfaces of the lake and melting distances suggest contemplation and isolation. Sandy Beach Macintyre River is another of the artist's choices and also the image featured on the exhibition invitation. This is a painting of twilight and long reaches of a silver river framed by deepening shadows. Meredith lists the contemporary Tasmanian landscape painter Philip Wolfhagen as one of her influences. Certainly, in this and other paintings Meredith's use of dramatic contrasts and particular formal elements are reminiscent of Wolfhagen. There are other motifs of Australian sunlight and lyrical responses to flowers in this exhibition which explore different themes and a fuller colour palette. Influences are varied, and Meredith expresses her abiding interest in European Impressionism and Post Impressionism. There is equal admiration for the expressionist paintings of Dufy and Van Gogh and some of the greats of the Australian landscape painting tradition such as Arthur Streeton and Lloyd Rees. Meredith is an artist who is absorbed in the landscape as her principal subject and her focus changes from the more muscular expressionist and up-front paintings of rocky coastlines and wave action to a more 'Romantic' and indefinite focus on the far. These variations suggest the artist's search for a technical means to express each unique experience of the landscape. Meredith's paintings are primarily created in the studio and the artist refers to photographs taken during her travels. Many artists such as Degas and Vuillard have used photography like a journal to assist recall. Thus, a photograph may stimulate a memory of a time and place. However, when the overriding concern in composing a painting is capturing an emotional response and the whole impression or atmosphere of experience the photograph is necessarily used with restraint. Herein the details of verisimilitude are always subordinate to a general scheme of relationships. Holdfast Yetman is an exception in this exhibition as a plein air painting. This small work exudes an atmospheric freshness and directness often difficult to maintain in studio works. Before the motif the artist is confronted with an open-ended range of possibilities over time including changing conditions of light. Visual focus is free to roam and not limited to a two-dimensional framework. The still life painting of flowers Free Spirit is also painted from life and exhibits a similar quality of freshness and inventiveness. As Far as The Eye Can See is a series of 3 paintings worked from memory which record the artist's impressions of seasonal variations in a familiar landscape. Meredith suggests that here composition is her primary concern and three seasons offer a pretext for exploring compositional variations in structure, colour and value. Meredith's desire to experiment and explore a range of pictorial possibilities is evident in this exhibition. Paintings such as the monochromatic Eastern Osprey Nest present an economic means while restating the artist's predilection for strong silhouette. Eastern Osprey Nest was awarded a first prize painting category 36th Open Great Lakes Art Award 2018. In recent years Meredith Howse has increasingly committed her time to painting. From 2009 - 2017, a period of 8 yrs, Meredith has shown her work in group and solo exhibitions. Her first major exhibition at Petrie Terrace Gallery in 2016 was as joint exhibitor. 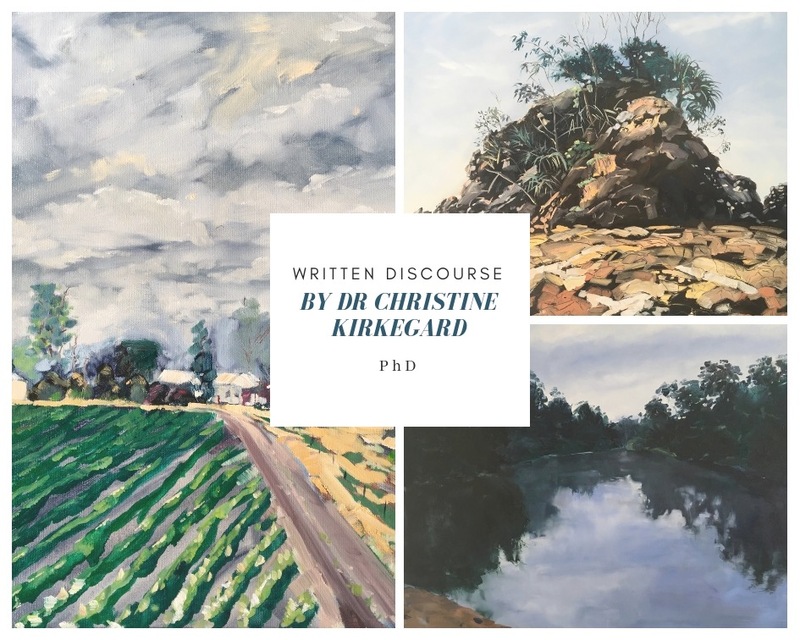 For this exhibition entitled Brisbane River Meredith's painterly focus was the Brisbane River, the landmarks and less familiar reaches from river source at Mt Stanley to entry into Moreton Bay. In 30 paintings Meredith explored the river and its ever varied urban and pastoral environs. In a relatively short period of time Meredith has indeed been prolific. She has also keenly researched her subject from investigation of the landscape to exploration of the processes of her craft. Meredith has been a finalist in a number of recent art award exhibitions including the Milburn Art Award 2017, Great lakes Art Award 2017,2018, The Lethbridge Small scale Art Award 2014-2016 and the Queensland figurative Art Prize 2016. Meredith Howse's latest solo exhibition Sublime Landscapes suggests a promising future for this emerging artist.